More than 36 million people in the United States have ancestors who came from Ireland. Many of us, growing up, heard stories of the Old Country. Although our grandparents might even have been a generation or two removed from the Emerald Isle, these tales were nevertheless passed down. But what they were describing was an Ireland that has long since passed, as the country is now very modern. If our ancestors were alive today, and tried to return, they'd be entering a world they no longer recognized. 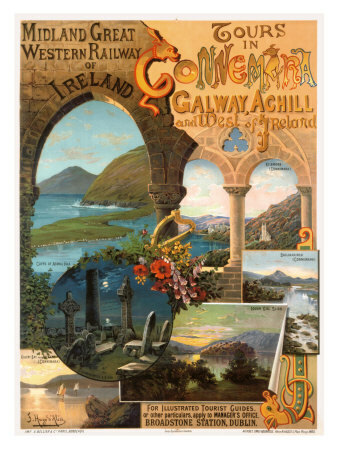 However, Ireland of old is still around, captured in vintage paintings and photographs. All of the photos and prints shown below are made available through a company named All Posters, a large image supply company based in Berkeley, California. It has an extensive collection of prints and photographs from all over the world. If you'd like more information about each picture, simply click on the image, and you'll be directed to the All Posters site. All pictures can be ordered with frames or without frames. 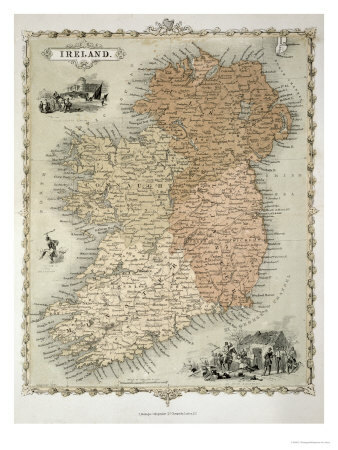 This reproduction of an old map of Ireland circa 1850, which is right around the time waves of immigrants started coming to America and elsewhere. Many were driven out of Ireland by a famine caused by a potato blight. Today, many more people of Irish descent live outside of Ireland than the country. The map shown below is 18 by 24 inches and features traditional Irish scenes on the edges. Many Irish who came to America began to work on the network of railroads that were being built to transport goods from one part of the country to another. However, back in Ireland, as the famine eased, the country passed a Light Railways Act in 1889. This freed up funds for government subsidies to build more railroads to bring commerce to remote parts of the island. The Connemara Railway was one of the runs. Trains left Galway and traveled through spectacular scenery along Ireland's west coast. The trains ran until 1935, when motorized vehicles were starting to become more popular. 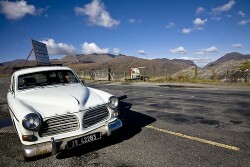 Tourists began to travel to the beautiful, but isolated, Connemara area by bus. The port of Cork was the point of departure for many Irish immigrants during the Great Famine, in which one million Irish died of starvation. 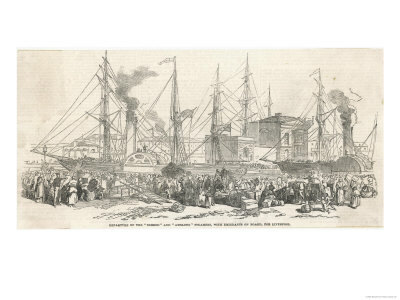 The scene below depicts immigrants getting on a steamer ship to travel across the Atlantic. The United States and Canada were prime destinations. But many Irish also went south, to Buenos Aires, Argentina and Chile. 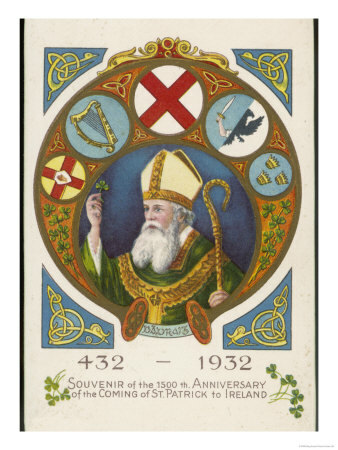 Saint Patrick lived from 387 to 461 AD. Many people assume he was born in Ireland and that he was ethnically Irish. But that's not true. His parents were Roman subjects working in Scotland. As a young teenager, Patrick was kidnapped and brought to Ireland. Once there, he was put to work as a slave and his job was tending sheep. However, during this time, he also developed a deep affection for the people of Ireland, who hadn't yet heard the message of Christ. Eventually, he escaped and returned to his family. Later called to the priesthood, he was elevated to the rank of bishop. He was sent back to Ireland, this time as a missionary. His example of patience, and his eloquent preaching, won many souls. St. Patrick is widely credited with converting the entire country to the practice of the Catholic faith. The mail must get through. Below is a vintage mail truck, once used to cart mail from village to village. 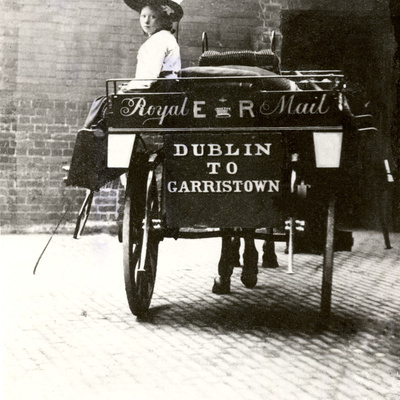 This one ran from Dublin to Garristown. 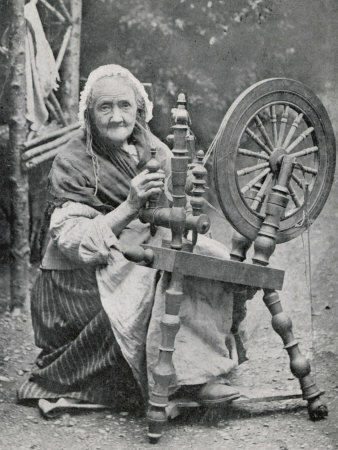 Spinning and weaving have long been a tradition in Ireland. This art dates back centuries before the Christian era, as evidenced by artifacts that have been dated to about 1600 B.C. Women have been the ones who have maintained the art of weaving. There were once female weavers guilds in Dublin. In recent years, there was been a renewed interest in this ancient craft. And from there it's spread around the world. I have yet to make it to Ireland, but I really want to go. Thanks so much for reading. Recently Maureen and I took Maureen's ninety five year old mother and invalid brother to see their relatives in County Mayo, West of Ireland. Maureen's mother is a Mayo woman. It is such a lovely place. The hotel was a friendly hive of social life [crac is the Irish term] and Mayo is an expanse of natural beauty and peace. The trip was only three days, but it was glorious. If you have not yet visited Ireland, make plans to do so. Connemara is delightful, Clifden, Kylemore Abbey, they are all beautiful. Tradition has it that the illegal brewing has its home in Connemara. I bet they were wonderful memories. Ireland sounds so enchanting. When I lived in Ireland for a year[at college] I would sometimes have a day off. I would walk down from near the border [near Blacklion, County Cavan] to Lough Allen, a long peaceful road where I saw very few people. A sixteen mile round trip. Once or twice I walked the mountain road, and saw almost no one, except a few farmers who waved greetings to me. It was a different world, and I long to return. Happy memories! I really want to get to Ireland some day. This scenery reminds me to visit Ireland - it is beautiful and full of natural beauty. I bet it is beautiful. My grandfather's father was born there. I've been to Ireland a couple of times. All four of my grandparents were born there. Lovely country!